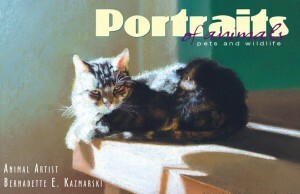 This portrait is a break from the usual larger, full-color and highly detailed portraits, just to share a little moment and focus on the expression, the face, the most-remembered part of just about any creature we love, human or animal. I had a number of photos, but none were close-up enough but this pose, though it was a little blurry, and I decided that just her face and paws were exactly what we needed. Creating a small composition in a small space is a balance of the details you want to use for focus with what becomes negative space and it doesn’t look like the subject is just cut off. 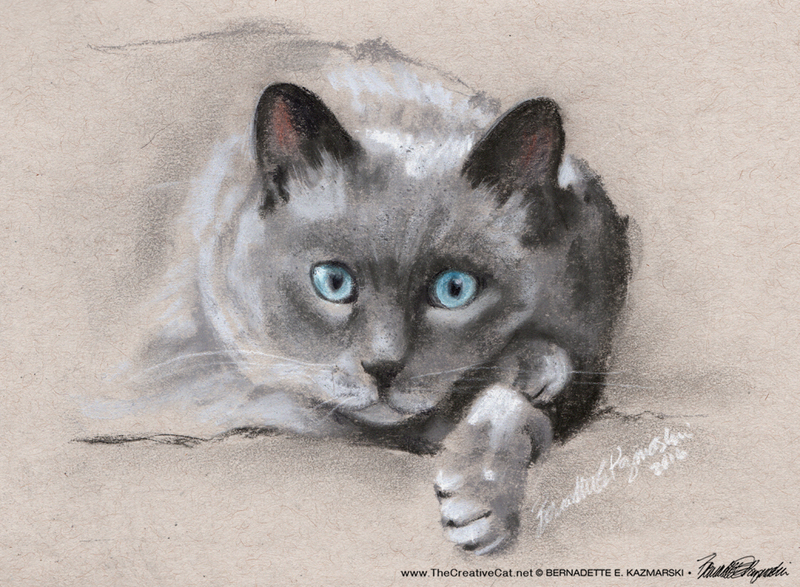 A lilac-point Siamese mix, I wanted to capture the subtleties of Chloe’s points and eye color along with the relaxed nature of her posture. I decided to use the gray toned paper so that I could work lights and darks from that mid-point and still include the blue of her eyes as an accent. Because the hue of the paper is close to the hues in the sketch she would naturally fade into the background with no clear stop or start and be limited by her shape on the paper. 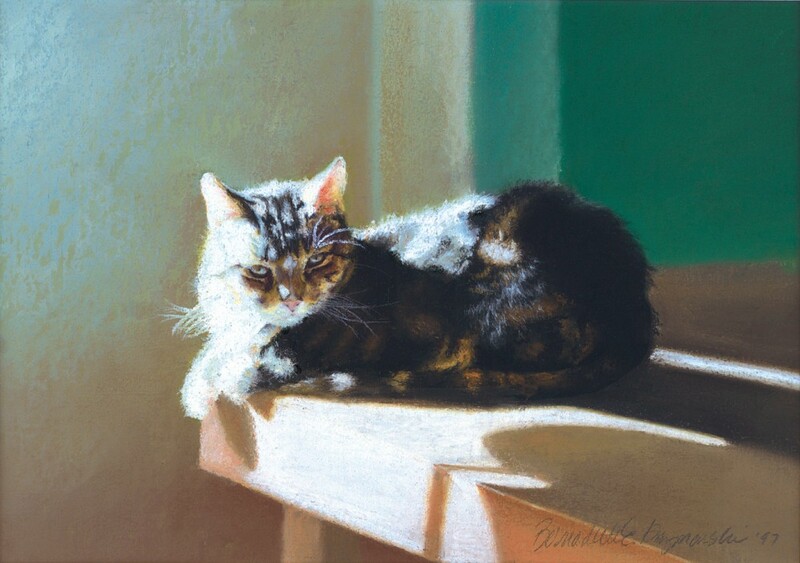 The paper itself has a warm tone while her fur tones are cool, and she has just enough definition against the background. I used my light and dark charcoal pencils to sketch her and define her eyes and nose and initially intended to use only the charcoals. But remembering the soft sheen on the lilac points I decided to use a few values from my set of gray pastels for her points and gentle shadows. What a pleasure. 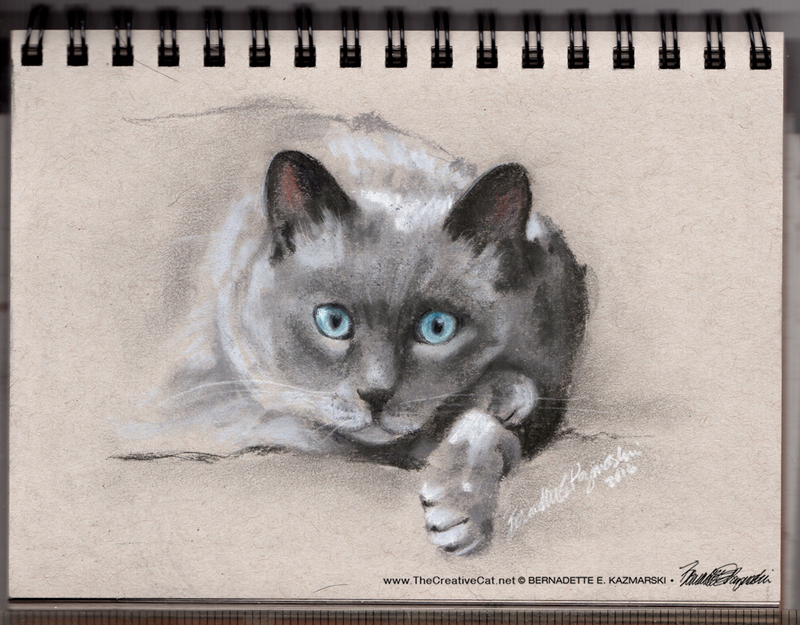 Just to show how small this sketch of Chloe is, here is a scan of the whole sketchpad before I removed the portrait. The sketchbook is 5.5″ x 8.5″ and seeing the size of the coil binding you can get a better idea of the size of the sketch. I like to do display small sketches that way too; it gives them a feeling of authenticity. Sometimes, just a little sketch is all you need to capture that memory. 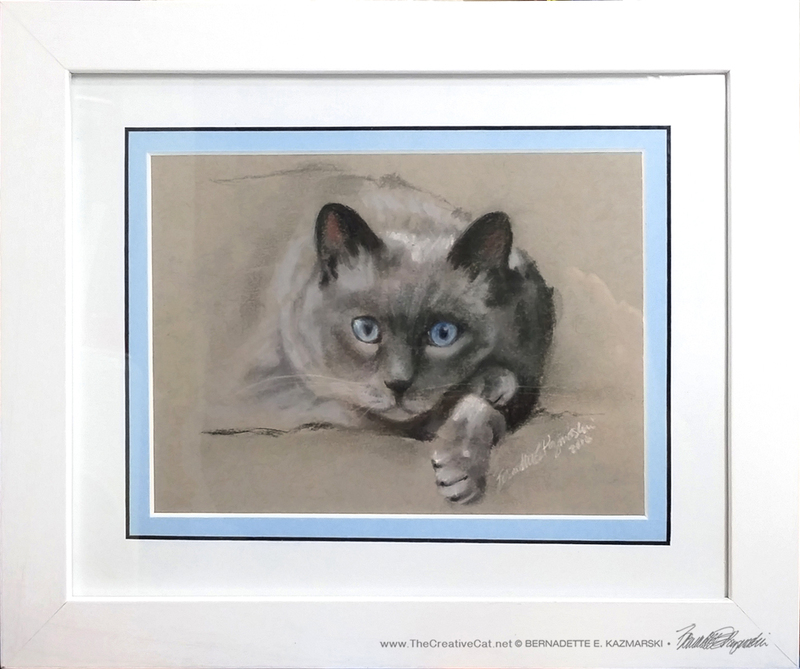 Chloe was a rescued mom adopted with her two kittens, and her portrait was a gift this Christmas. 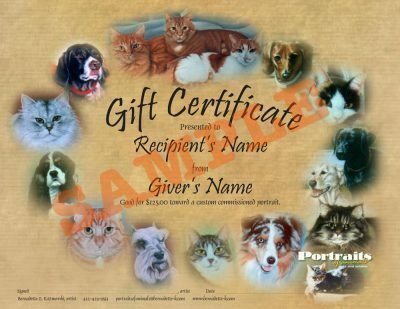 The person who commissioned it, though, was not the person who had rescued or adopted Chloe, or even her owner. She was the neighbor who became her pet sitter when Chloe’s older people were away grand-baby-sitting or on vacation. 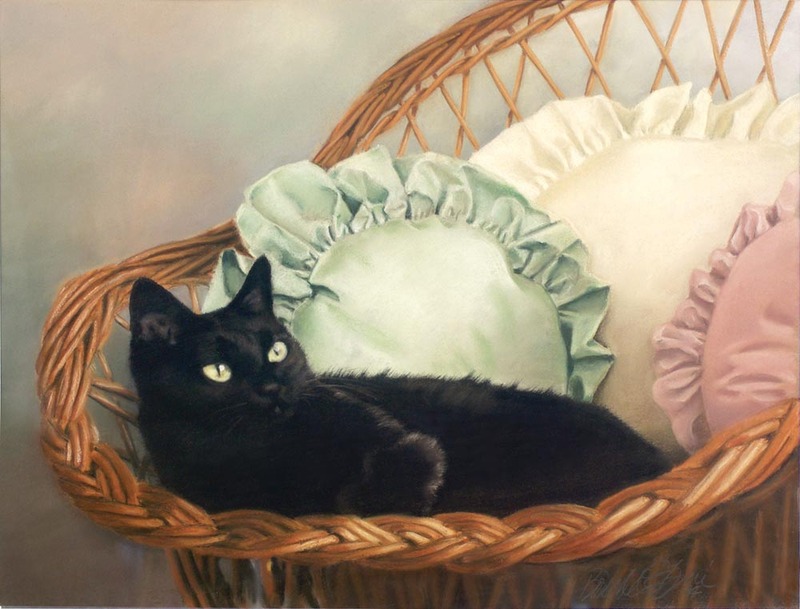 Chloe and her kittens could be skittish and frightened of strangers, but Mary befriended the little mom cat when she’d been a substitute sitter, and was happy to eventually be asked to visit for the three when their people were away. Chloe became her friend, and the two formed a special bond. Chloe developed diabetes and sadly this year developed pancreatitis, and the combination of the two took her life at the end of October at the age of only eight years. Just as much for her own grief as it was for her grieving neighbor, Mary asked me to do just a little portrait of Chloe, and left the details up to me. I also framed this portrait for the customer. I purchase quantities of matte black and white frames and some wood tones when available, and I can frame portraits with a plain white mat up to 16″ x 20″ frame size for a flat fee. I had a piece of mat board that matched Chloe’s eyes, though, and I couldn’t not use it because I knew it would be the perfect addition to the simple white mat and frame, and it was. And then I decided to use a little piece of white black core mat and I really love how it came out.